Why are invitation important? A lot of people take invitations for granted. They have this misunderstanding that it is not an important part in planning a party because it is usually gets thrown away after the event. 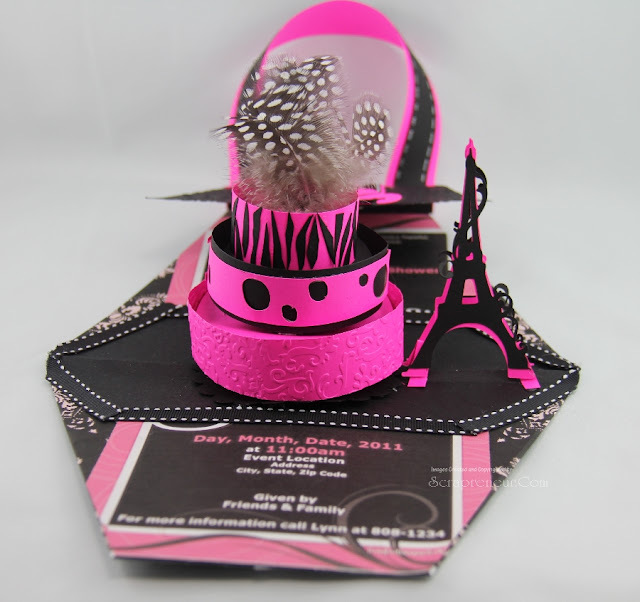 What most people do not know is, invitations sets the tone for your event/party. If you want to give your guest an impression and build excitement for what they should expect from the event, you have to pay attention to your party invitations. You build a good impression before the party not after the party. 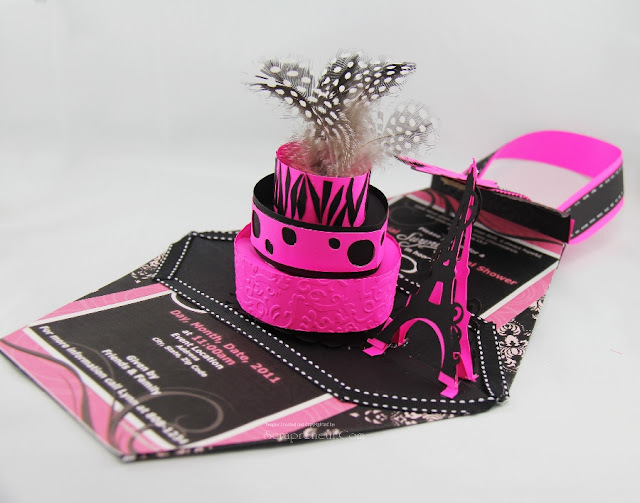 My newest designed Pop-Up Purse Invitation is an example of setting a tone to your party with style. If your guests receive this stylish party invite, you will give them an idea of what theme you are going to have at your party. Your guests will be elated to receive a party invitation that is well-thought and well-crafted like this Pop-Up Purse Invite. So how did I come up with this design? Since I have been designing Exploding Boxes with 3-Tier Cake invitations recently. I had this idea to combine all the techniques I knew and created this Pop-Up Purse Invitation. As you know, I love to make 3 dimensional projects. So this one is no exception. When your party guests receive these invites, they might think it is just a Purse, but when they open it, a 3-Tier Cake will Pop-Up! How cool is that? I love the Hot Pink and Black combination. I am satisfied and happy with the final look of my 3-tier Paper Cake and the Eiffel Tower is a perfect addition to my design. This Pop-Up Purse with 3-Tier Cake Invitation is perfect for a Bridal Shower party, Sweet 16th, Quiceañera, 18th Birthday or any other party event. 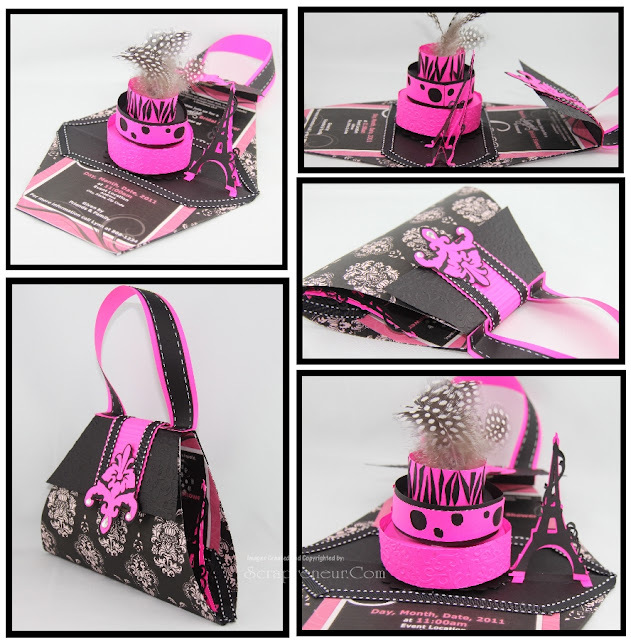 The complete Pop-Up Purse with 3-Tier Cake is now available on my ETSY shop. Thanks a lot for stopping by. Please leave me a comment below, I love reading comments! What a great idea to combine these ideas. It really makes for a stunning invitation! WOW!! This is a fabulous pop-up on so many levels. The front is gorgeous and leads into the spectacular surprise on the inside. Two thumbs up from me!!!! i am amazed of how beautiful these items are...i shouldn't say items these peace of art!! the apperance is so luxurios and stylish really nice!!! Do you have tutorials for the pop up purse invitations? ?